One of the things we learn as weavers is to look at the whole picture - so to speak. Bringing cloth into material form (pun intended) from individual strands of thread means you have to look at the whole thing. Fibre characteristics, how the yarn has been spun, the colours being combined weave structure. Et cetera. But you also have to look at the entire process of getting that yarn into the loom. Even smaller, less mechanical looms, all have processes that need to be learned and followed. 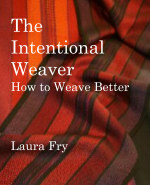 The physical skill of interlacing the weft with the warp cannot be ignored. Poor processes on top of poor techniques getting the warp into the loom will mean poor results. At times one needs to step back - waaaaaaaay back - and take a look at the whole picture. In many ways weaving reflects life in this respect. We can get so caught up in the minute details of life - or weaving - that we do not see the entirety of what is happening. Like the warp that doesn't go over the back beam...everything looks fine at the front of the loom but at the back? Oops. We think we have done everything correctly, but we forget to factor in the things that can either go horribly wrong, or that need to have special treatment. Not everyone, or every yarn, is the same and sometimes we have to adapt what we are doing in order to get the results we desire. Sometimes it is a matter of poor equipment choices. Looms are not the same, nor are shuttles. The shuttles I prefer for my big hands won't work for someone with much smaller hands. So all I can do is say what I prefer and why and let people figure out what will work best for them. Because change one thing and everything can - and usually does - change - one way or another. So it also is with getting this conference up off the page and into reality. We are dealing with over 20 different instructors, all with different needs and requirements. We have 255 workshop seats and 500 or so conference seats. That's a lot of detail and a lot of different people who need to be dealt with. As we come closer to the event, we will be fine tuning the event and arrangements. And asking for volunteers. In the meantime we are keeping our focus on the big picture - sort of like building a jigsaw puzzle - knowing where we want to be and fiddling with the little bits and pieces of the puzzle, making sure we get them into the right place in the picture. Or like making a cloth - warp and weft, fibre and yarn, colours, and wet finishing.